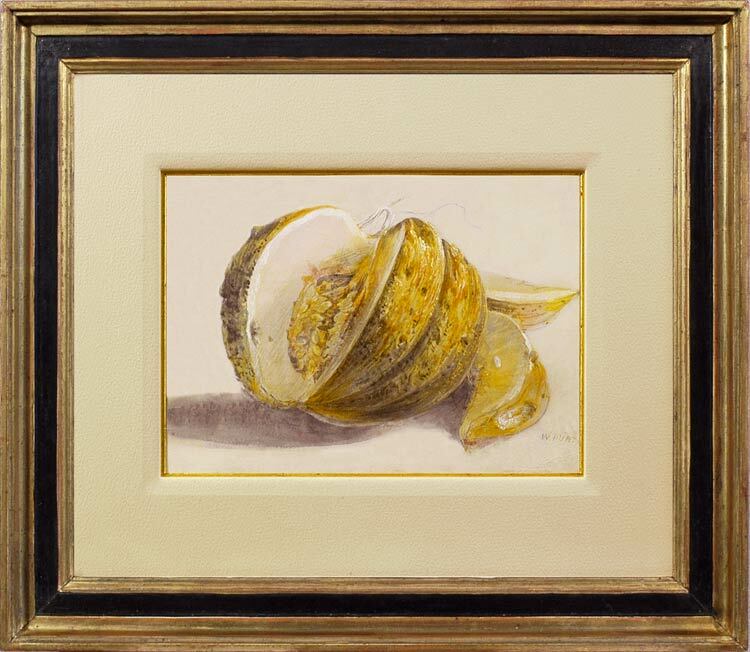 A study from life, possibly a working drawing for one of his highly-finished still life paintings, this displays all of Hunt’s attention to detail and his extraordinary facility with watercolour. Using a limited range of greys and ochres on tinted paper, with white bodycolour and a touch of red, the artist has concentrated on the realization of the melon’s various textures, from the corrugated peel and spongey pith to the flaws in the flesh and skin. The pips are carefully outlined in pencil, but coloured with rapid panache in touches of grey and gold. The result is a striking exposition of an artist’s method of working, which delivers to the spectator the essence of a melon. Hunt was born in 1790 in London, the son of a manufacturer, and was apprenticed at the age of 15 to the artist John Varley, with whom, and his fellow apprentice, John Linnell, he painted en plein air. He also attended the Royal Academy Schools and Dr Monro’s academy. Hunt had deformed legs, so his sketching expeditions around Monro’s house in Bushey were made on a barrow pulled by a man or a donkey. By the time he was 17, he had had three oil paintings accepted by the R.A.; however, he was innately drawn to watercolour painting, in which he became a technical master. He was a pillar of the Old Water-Colour Society from its inception, and was elected a member in 1826. His earlier works include landscapes, church & secular interiors and portraits, but he became progressively more drawn to still life painting. In 1830 he exhibited his first painting of a bird’s nest, a subject which became so linked with his name as to earn him the nickname ‘Bird’s nest Hunt’. His paintings of nests, eggs, fruit and flowers in various combinations, often arranged with studied carelessness against a bank of moss and grasses, were enormously popular, and painted with an accuracy and detail which anticipated the work of the Pre-Raphaelites. His technique is also a foretaste of Pre-Raphaelitism, in that he painted, if not on a wet white ground, at least on a white ground: in other words, he worked on a prepared surface of Chinese white mixed with gum arabic. Watercolours applied over this ground achieved an astonishing degree of luminous transparency, which adds considerably to the charm of his apparently simple and rustic subjects. Ruskin considered him one of the finest painters of still life of his period, and in 1854 and 1861 Hunt gave Ruskin lessons in painting. As a mature artist he produced genre scenes and interiors which exhibit the same compositional and technical skill as his still life paintings, and for which his wife and his daughter Emma often modelled. He lived in Hastings, where a local family of three brothers, the Swains, also modelled for him for many years. His approach was consistently experimental and innovative; he used a stippling technique to apply colour and tone – particularly in his portraits and figure studies – and raised highlights by scratching down into the paper. Works in public collections include 76 works in Tate Britain; 3 in the V&A; 39 in the Courtauld Institute of Art; 17 in Manchester City Art Gallery; The woodcutter’s breakfast, c.1832-34?, Metropolitan Museum of Art, New York; Daughter with bowl, 1857, Indiana University Museum; Shells and other works, Harvard University Art Museums; Dead game hanging, Portrait of Mary Bugden Hunt & other works, Philadelphia Museum of Art; eight portraits in National Portrait Gallery, London; and many works in other collections worldwide.